Just last week, we surpassed the record number for women candidates filed to run for the U.S. House of Representatives. As of April 6, 309 (231D, 78R) women filed in the 29 states where filing deadlines have passed and candidacies have been certified. The previous high for women primary candidates for the U.S. House was 298, set in 2012. With 21 states left to file or certify candidacies, the number of women candidates across this year’s U.S. House primaries will most certainly confirm predictions of a surge in women running. Amidst the narratives of women’s surge in candidacies and political engagement being floated by organizations and news media, it’s hard to see these particular data on women House candidates in the appropriate context. Within that context, you’ll find that women remain underrepresented among all House candidates, despite increasing in number and proportion of candidacies from 2016 to 2018. How do the numbers of women candidates compare to the numbers of men who have filed to run for the U.S. House? As of April 6, women are just 21.9% of the major party candidates that have filed for the U.S. House. This is the other half of the story in election 2018: the number of men running is also up, and male candidates still far outnumber women running for the House. How do these data compare to previous election cycles? In the 2016 U.S. House elections, 17.8% of all of the candidates on primary ballots or successful in party conventions were women. * While these data reflect candidacies across all states and account for any filed candidates who withdrew before ballots were printed, they indicate that the proportion of women candidates – not just the number of women running – is up this year from the previous election cycle. Another way to compare the data is to look only at 2016 House candidates only in the same states that have already filed and certified candidates in 2018. Women were 15.9% of primary candidates and convention winners in these states in 2016. The data in the table below show that the number of filed candidates in these 29 states is up by nearly 40% from the number of primary candidates on 2016 ballots or successful at party conventions. That number masks an enormous gender gap; while the number of male candidates is up by about 28% in these states overall, the number of female candidates is nearly double – 90% more – what it was in 2016. 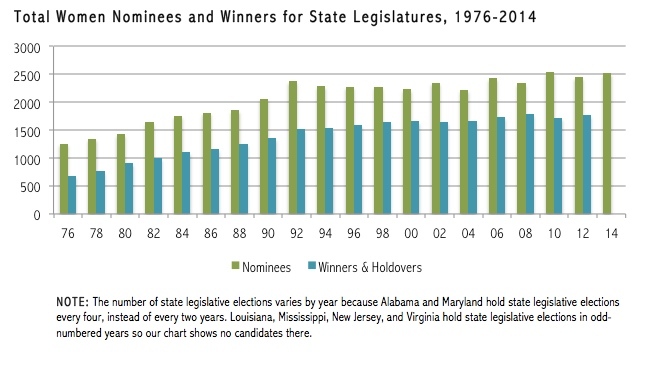 NOTE: 2016 data reflects the number of men and women candidates on primary ballots or successful in nominating conventions (where the conventions were held in lieu of a primary election). 2018 data reflects the number of men and women candidates who filed and whose candidacies were certified according to state election officials in the 29 states that completed certification by April 6, 2018. Are these findings consistent across party? Short answer: no. To start, 75% of the major party women candidates who have already filed for the U.S. House are Democrats. And the underrepresentation of Republican women is particularly stark when reported as a proportion of all filed Republican House candidates. As of April 6, just 12% of all filed Republican House candidates are women, while women are 30.2% of all Democrats filed to run for the House. In a previous analysis, I made the point that the “pink wave” in 2018 hues blue, demonstrating how much of the increase in women House candidates this year is concentrated among Democrats. When focusing specifically on the states where candidates have already filed this year, this story remains true. Compared to 2016 numbers of candidates on primary ballots or winning conventions in the same states, Democratic candidacies are up by about 68% overall, by 51% among Democratic men, and by 126.5% among Democratic women. The increase in Republican women candidates (28%) is larger than among Republican men (12%) from 2016 to 2018, but overall the rise in candidacies among Republicans is minimal (13.5%) and unequal to that among Democrats running for the House in 2018. CAWP’s Election Watch provides updated numbers of women candidates in real time, including breakdowns by filing status, candidate type (open seat contender, challenger, incumbent), party, and level of office. These data help to provide additional context to understand gender differences among 2018 candidacies, as do analyses that have shown that challengers make up a high proportion of women House candidates and that many women candidates are running in districts where members of their party are unlikely to win. These details matter, not only for understanding what is happening in electoral politics today, but also for predicting and contextualizing what happens in November. Thus far in 2018, the House data show that the progress for women candidates is real but not universal, and that the push to gender parity in congressional elections – at least vis-a-vis candidate numbers – is far from over. * The proportion of filed candidates today may not reflect the total candidates on primary ballots (the measure used for 2016 data) if any candidates withdraw before ballots are printed. Candidate Competence: Is There a Double Standard? The 2016 presidential election has brought questions of gender, sexism, and the role of women in politics to the forefront of national conversation. Are Americans ready to see a woman in the role of President, an office that has long been an exclusively male domain? How do our expectations about presidential masculinity—strength, “toughness,” military might—influence the way we evaluate the first female major party nominee? In what ways are voters’ impressions of Hillary Clinton, who has been a major presence in American politics for decades, influenced by the many examples of gendered (and often blatantly sexist) media coverage and comments from her opponent’s campaign? It is difficult to untangle the effects of gender from the unique circumstances surrounding Clinton herself—her level of experience, name recognition, and many years in the public spotlight ensured that many voters knew who she was well before she announced her candidacy for president, and most voters already had strong opinions about her, as well. However, in order to get a better sense of some of the ways gender has mattered in this race, it may be useful to consider some recent work from political science on how gender stereotypes affect voting behavior, including a new article I wrote (Ditonto 2016) that examines how participants in an experiment evaluated male and female candidates whose competence to serve in office was called into question. In general, I find that women who run for office are more vulnerable to information that casts doubt on their competence and experience than are men. Participants in two experiments liked “incompetent” women less than “incompetent” men and were less likely to vote for them, as well. Scholars of women and politics have conducted many studies over the past several decades trying to determine whether and how gender-based stereotypes influence women who run for, and serve in, political office. Despite the large amount of attention devoted to this question, though, the evidence is somewhat inconclusive. Many studies have found differences by gender in the ways that candidates are evaluated—women are perceived as more liberal, compassionate, trustworthy, warm and emotional, but less competent, “tough,” and strong (e.g. Huddy and Terkildsen 1993; Kahn 1996). However, some of the most recent work in this area seems to indicate that gender-based stereotypes are not automatically applied to women candidates and that other considerations, like political party affiliation, are much more important to voters than a candidate’s gender (Brooks 2013; Dolan 2014; Hayes 2011). Yet a third group of studies have found evidence for a sort of “middle ground” for the effects of gender-based stereotypes, suggesting that they may matter for some women candidates in certain electoral contexts, but not in others. The extent to which gender stereotypes matter seems to depend on a number of factors, including the nature of the political advertisements used (Bauer 2015), the policy issues emphasized (Lawless 2004; Holman et al 2011), and the amount or type of other information available during a campaign (Matson and Fine 2006; Ditonto, Hamilton and Redlawsk 2014). The findings from my most recent study fall into this third category. The point of the study was to determine whether earlier findings that women candidates are often seen as less competent (e.g. Huddy and Terkildsen 1993; Schneider and Bos 2014) would hold if information related directly to a candidate’s competence was also available to voters—things like evaluations of a debate performance, comments from a staffer, or a newspaper editorial. I wanted to know how this sort of substantive, politically-relevant information would change voters’ perceptions of candidates, and whether it would matter differently for women candidates than for men. A previous study some colleagues and I conducted (Ditonto, Hamilton and Redlawsk 2014) found that participants in an experiment that simulated a political campaign sought out more information about a candidate’s competence and experience when that candidate was female. In that experiment, all of the information available about the candidates portrayed them positively—as very competent. However, if voters are seeking out more competence-related information for women candidates than for men, what happens when the information they encounter makes them seem less than totally competent? In order to find out, I conducted a computer-based experiment that mimicked a presidential campaign between two fictitious (but realistic) candidates—one Democrat and one Republican. Each participant experienced a “campaign” in which various pieces of information about the candidates scrolled down their computer screen. They could click on whichever items they wanted in order to learn more about a particular topic, and their choices included things like the candidates’ policy positions, ideology, family, educational background, etc.—the same kinds of things that are usually available during a real political campaign. The experiment varied two important factors within the campaign, however. First, half of the people saw two male candidates in the race (one in each party) while the other half saw a woman running in their own political party and a man running for the other party. Second, there was also a subset of information that related specifically to how competent the candidates seemed (how they did in a debate, how the candidate’s opponent talks about them, comments from a newspaper editorial, a description of the candidate’s prior political experience, how the candidate did while holding previous office, and a description of the candidate by a former staff member). Again, I split the sample of participants into two groups—for half of them, this information portrayed their party’s candidate as very competent. The other half saw information that made their party’s candidate seem less competent than one might hope for. The results suggest that a candidate’s gender plays a big role in how much we care about his or her perceived competence. Women and men who were portrayed as competent did about equally well in both the outcome of the election and participants’ evaluations—candidate gender didn’t matter to them as long as the candidate seemed competent and qualified. When they were presented with a candidate who seemed less than competent, though, women candidates did far worse than men did. In fact, subjects who saw incompetent women in their party often rated the candidate in the other party as favorably or more favorably than they rated her, and were actually more likely to vote for the other candidate! This was a pretty unexpected finding, since party affiliation is almost always the strongest predictor of someone’s vote choice. Importantly, incompetent male candidates didn’t suffer the same fate. Essentially, competent and incompetent men fared equally well—their chance of receiving a subject’s vote and the extent to which a subject liked them remained the same, statistically speaking, whether they were portrayed as competent or incompetent. In other words, participants didn’t seem to care whether their candidate was competent or not, as long that candidate was a man. In a sense, these results are good news for women candidates. If they come across as competent and qualified, they can do just as well as men. This means that they are not automatically disadvantaged by stereotypes that women candidates are less competent than men. On the other hand, women seem to be disadvantaged by negative portrayals of their competence in ways that men simply are not. Perhaps we should be more surprised that subjects liked incompetent male candidates as much as they did! The current presidential election may be a pretty good real-world example of this phenomenon at work. Hillary Clinton is widely considered to be one of the most well-qualified candidates ever to run for president, and even her detractors acknowledge that she has far more political experience than Donald Trump, at least in the traditional sense. Yet, there has been a great deal of talk about the different standards that the two are often held to by the media, and even by voters of their own parties. Trump’s seeming ability to get away with saying and/or doing just about anything without losing support is a marked contrast to Clinton, who is continually attacked for things like her “lack of judgment,” not looking “presidential enough,” and not being “authentic.” To be sure, there are many factors at play that contribute to these dynamics, but my findings suggest that that a double-standard when it comes to male and female candidates’ competence may certainly be part of the story. Read more about Candidate Competence: Is There a Double Standard? Scholars have long lamented the lack of women candidates for public office. Attempts to recruit women candidates have been widespread, targeting older women with empty nests, younger women without children (or those not interested in having them), lawyers and businesswomen whose experience mirrors that of typical male candidates. But another pool is waiting to be tapped: losers, women who have previously run for office but did not win. Challenges to re-recruiting these women to run are deep-rooted in societal expectations of women. Yet, the 2016 presidential race offers two examples, Hillary Clinton and Carly Fiorina, who have not let political setbacks stop them from pursuing their goals. Their decisions to persist despite earlier failed campaigns should inspire other women who have run and lost to jump back in the fray. The common refrain that “when women run, they win” refers to evidence that women and men have similar win rates in general elections (Newman 1994; Sanbonmatsu 2006). But what happens if they lose? Women are less likely than men to run for election after suffering a defeat (Dolan et al 2015). Convincing women (who are less often self-starters) to throw their hats into the ring in the first place takes time; sometimes it requires additional resources from political parties and women’s organizations. (See CAWP resource Poised to Run.) If the woman candidate loses her first election and sours on the prospect, that investment may never pay off. For women who suffer from self-doubts about their qualifications, a loss may provide an excuse not to run again. (Fox and Lawless 2010). Yet the 2016 presidential campaign showcased two women candidates who dusted themselves off and got back in the game. Hillary Clinton’s presidential run in the 2008 Democratic primary was a bruising political defeat. Conceding the nomination to relative newcomer Senator Barack Obama, then-Senator Clinton said, “Although we were not able to shatter that highest and hardest glass ceiling this time, thanks to you it has 18 million cracks in it, and the light is shining through like never before, filling us all with the hope and the sure knowledge that the path will be a little easier next time.” Republican presidential candidate Carly Fiorina lost a highly visible Senate race to incumbent Barbara Boxer in 2010. The return of both Clinton and Fiorina to the presidential race in 2016 to take yet another crack at high office is a welcome model for women recovering from election defeats at lower levels all across the country. In an interview with the Washington Post, Fiorina’s senate campaign manager, Marty Wilson, said, “Carly was bummed after the loss, but I encouraged her to stay involved and run again. I told Carly she should run for president in 2012 and she said I was ‘Nuts.’” Fortunately, Fiorina changed her mind (with encouragement from a political insider). Her compelling performance in the August primary debates established her as a significant presence in the crowded Republican field. Despite her loss in the 2008 Democratic presidential primary, Hillary Clinton was identified early as the obvious choice for her party’s nomination in 2016, based in part on experience she gained as Secretary of State – a position she won as a consequence of both her service on the Senate Armed Services Committee and her strong showing in ’08. One never knows what may follow even a losing campaign. Many women officeholders cite their campaigns for lower office as having signaled to powerbrokers their willingness and ability to serve in appointed positions unanticipated before their races. In Hillary Clinton’s case, seizing the opportunity to serve as Secretary of State under her 2008 opponent, Barack Obama, positioned her for her 2016 run, with the added credential leading many to call her the most qualified presidential candidate of the modern era. There are plenty of reasons not to dust oneself off and try again. Campaigns are costly, both financially and emotionally, as well as in time that may be in short supply for women who are still responsible for the bulk of household maintenance and often breadwinning for their families. But there may be more at play as well. Self-doubt has been documented among women in likely candidate pools, and it begins early. In analyzing college-age women and their pursuit of leadership opportunities on campus, Keohane et al 2003 found that at Duke University many women undergraduates were under the pressure of “effortless perfection: the expectation that one would be smart, accomplished, fit, beautiful, and popular, and that all this would happen without visible effort”. It is possible that women candidates face similar social expectations (think supermom and having it all) and a hard-fought campaign loss is hardly evidence of effortless perfection. So what will it take for women to overcome this? Angela Lee Ducksworth, an assistant professor of psychology at the University of Pennsylvania, argues that success is largely dependent upon grit, described as “passion and perseverance for very long-term goals. Grit is having stamina”. Political campaigns certainly require stamina, and women’s individual tenacity should be supplemented by political parties who can provide volunteers, funds, and public statements of support to make it easier for women to take another chance. Like political campaigns, the adage exemplifying grit, “If at first you don’t succeed, try, try, again” may also be gendered. Carol Dweck, the Lewis and Virginia Eaton professor of psychology at Stanford University, has found that talented girls are less likely to persist following a failure because they perceive abilities to be innate rather than a consequence of effort and practice (Dweck and Leggett 1988). These beliefs may persist into adulthood, as Kay and Shipman (2014) find that women are more likely to blame themselves for failure and give credit to other factors when they succeed, while their male counterparts dismiss failure and claim credit. Knowing that these gendered differences exist, it is important to highlight the number of men in public office who were not successful at first. They include President Bill Clinton in his 1974 Arkansas congressional race and President George W. Bush in his 1978 Texas congressional race. Even President Barack Obama lost a 2000 Illinois Democratic congressional primary before going on to win a Senate seat in 2004. Speaking to a broader audience, Johannes Haushofer, assistant professor of psychology and public affairs at Princeton University, recently posted a CV of his failures, arguing that making his own failures visible to others would prevent them from wrongfully attributing their own failures to individual flaws rather than the external factors that could be at play. In the context of a campaign, there could be any number of reasons why a candidate doesn’t receive the most votes irrespective of a candidate’s suitability. The knowledge gained from an initial loss is invaluable to a qualified candidate who may perceive her loss as an indictment of her abilities alone, when in reality she might just need a different campaign manager, a better communications strategy, or a race for a different type of office. Start-up companies across Silicon Valley have spoken out about the importance of failure and learning from our mistakes, indicating that value can come from experience – even negative experiences. Publically admitting failure is certainly easier for those with privilege. Because male candidates are the default, men who lose and try again may be seen as the “comeback kid” or a “fighter”, while women may be tainted by the loss. It most certainly is easier for a man than a woman to overcome a loser association. That means women should be strategic in the selection of their races, but being strategic shouldn’t mean permanent retirement. It should mean learning from one’s mistakes and demonstrating the toughness that qualifies you for public service. With so few women running for and holding office, the pressure not to let down an entire gender is high. Furthermore, those with fewer resources don’t always have the option of another go-around. It is vital, then, that political parties and women’s organizations provide the institutional support that would make it easier for women to make a second attempt. For their part, women who don’t win on that first try should take a lesson from Secretary Hillary Clinton and Carly Fiorina and go back at it, bringing even more as a consequence of the earlier defeat. In her commencement speech at the University of Rhode Island, Supreme Court Justice Sonia Sotomayor told graduates, “The ‘uh-oh’ moments are worth cherishing just as much as ‘ah-ha’ moments: Mistakes, failures, embarrassments and disappointments are a necessary component of growing wise”. Wisdom is surely a valuable commodity for public officials. Wisdom gained through failure is something previously unsuccessful women candidates can bring to the table, rather than something that should disqualify them from another campaign. We need more women in public office. Not perfect women – wise women. Sometimes that is going to mean stepping up one more time. By Jean Sinzdak, Director, Program for Women Public Officials, Center for American Women and Politics In January, Joni Ernst (R-IA) will be among the 104 women serving in the 114th US Congress. 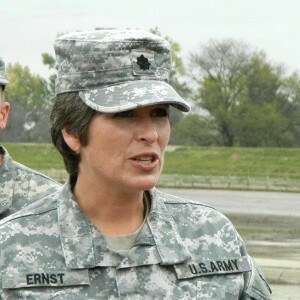 In addition to being the first woman elected to represent Iowa in Washington, Ernst made history in November as the first woman veteran elected to serve in the US Senate. 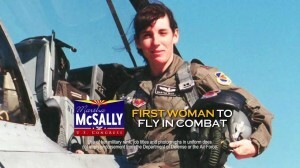 She will join fellow veterans Tulsi Gabbard (D-HI) and Tammy Duckworth (D-IL), who made history in 2012 as the first female combat veterans elected to serve in the US House, and Martha McSally, who was elected to the House this year from Arizona. With these additions, six women veterans will have served in Congress. (Former Representatives Catherine Small Long (D-LA), Heather Wilson (R-NM), and Sandy Adams (R-FL) round out the group.) CAWP’s research indicates that women bring different priorities and experiences to public life, and women officeholders help make government more transparent, inclusive and accessible. Women public officials – elected and appointed – have an impact on public policy that ultimately affects the entire population of the state, region and nation. Today there are an estimated 2.2 million female veterans, and they represent one of the fastest growing segments of the veteran population – about 10 percent of the total 22 million veterans in this country. Women veterans have already put their country first by serving in the military; they are exactly the kind of people we need as public leaders. And recognizing the distinctive experiences of women in the armed services, it’s clear that women vets will bring especially valuable insights to Congress. CAWP has partnered with the Department of Veterans Affairs’ (VA) Center for Women Veterans to help women veterans develop skill sets to prepare them for public and community service opportunities within their communities. The Center for Women Veterans, created in 1994 to monitor the VA’s administration of benefits and services to women Veterans and to advise the Secretary on the VA policy’s impact on Women Veterans, will advise CAWP on how it focuses its resource information to address women veterans’ issues. “Women veterans often contact us for information about how they can continue serving,” says Elisa M. Basnight, director of the Center for Women Veterans. “This agreement with CAWP presents a prime opportunity for the Center to help prepare them for other forms of public service as it responds to a persistent need women veterans tell us they have, which is the desire to continue to make a difference after the uniform.” CAWP is also partnering with Veterans Campaign, a program of the National Association for Uniformed Services, on a female leadership workshop at their Veterans Campaign Training, which will be held on Feb. 21-25, 2015 in Washington, DC. In addition, women veterans (and any women!) can attend one of the Ready to Run® programs hosted by CAWP or our partners around the country – upcoming programs can be found here. Additional campaign trainings and leadership programs can be found on CAWP’s national Political & Leadership Resources for Women map. For more information about and other resources for women veterans, you can also visit the Center for Women Veterans. It’s official. We started election 2014 with 20 women in the U.S. Senate and we will enter the 114th Congress with 20 women in the U.S. Senate. With Senator Mary Landrieu’s (D-LA) defeat this weekend, the status quo is upheld. However, the make-up of the women members will be different in 2015. Two new women senators were elected in 2014, including Representative Shelley Moore Capito (R-WV) and State Senator Joni Ernst (R-IA). They take the place of two women who were defeated in their bids for re-election: one-term incumbent Senator Kay Hagan (D-NC) and three-term incumbent Mary Landrieu (D-LA). As a result, the partisan make-up of the women senators will shift from 80 to 70 percent Democratic; 14 Democratic women and 6 Republican women will serve in the 114th Congress. And while no records were broken for the number of women candidates, nominees, or winners in U.S. Senate races this year, both female newcomers do make history as the first female Senators from their states. In fact, Ernst becomes the first woman ever sent to Congress from the state of Iowa. Together, Capito, Ernst, and the 4 current Republican women senators will make up the largest class of Republican women to serve at one time in the U.S. Senate. Incumbents Jeanne Shaheen (D-NH) and Susan Collins (R-ME) were re-elected in 2014, but only 4 of 15 total female Senate nominees were successful this year. This year’s four female winners join the 16 women senators not up for re-election this year, including only one woman of color: Senator Mazie Hirono (D-HI). 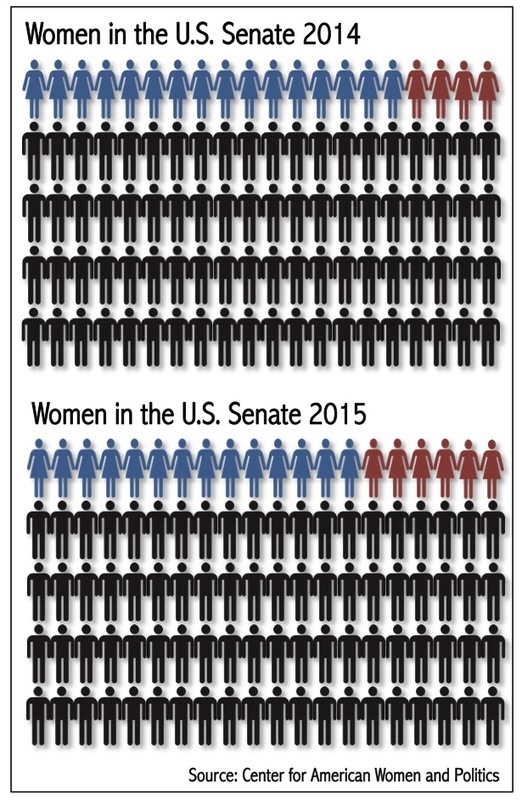 While many celebrated the jump to 20 women in the Senate after the 2012 elections, election 2014 serves as a reminder that the pace of progress for women in the U.S. Senate is inconsistent and, most striking, slow. That pace is unlikely to quicken without a steady increase in the number of women candidates filing for competitive seats and making it through their primaries. The balance of gender power in the U.S. Senate is not only measured in overall numbers, but also in the power women hold in party and committee leadership. 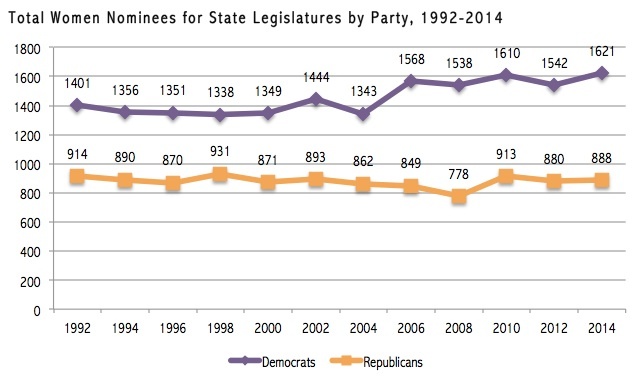 Due to the shift in party power from the 113th to 114th Congress, Democratic women who currently hold 9 committee chairmanships and co-chairmanships will lose their leadership posts. There are fewer Republican women with the seniority needed to win these positions, making it likely that the number of women committee chairs will decline in the 114th Congress. Republican women will also make up a much smaller proportion of the Republican caucus (11.1%) than Democratic women's proportion of the Democratic caucus (30.4%), presenting another potential hurdle to their influence in agenda-setting and strategy discussions within the majority party. Five more women senators will be up for re-election in 2016, but it will take a larger class of nominees for open seats or as competitive challengers to see significant change in women’s representation in the upper chamber of Congress in the next election.